Ever came across this larger-than-life mural on the busy streets of Margao? This vibrant piece of urban art with a very profound message has been painted by Goa’s very own, young power-house of talent, Dattaraj Naik. Café speaks to Naik to find out more about his take on street-art, football and the vital message that he tries to convey through his work. HC: Could you tell us a little bit about your art background and career? I have completed my graduation from Goa College of Arts, Panjim. I later moved to Baroda to pursue my Master’s in Applied. I now work in Delhi as an illustrator with Guerrilla Art & Design. I also work as a street-artist and a freelancer. HC: It’s believed that artists choose those topics which they feel strongly about or is close to their heart. So do you have any fond memories of football which helped in coming up with this idea? Of-course! Ever since childhood, I have always loved playing football. I have played football throughout my schooling years and have also been a part of the college football team. Free-styling had fancied me a lot. I still take out time in Delhi to come out and play for a while. It’s a sport that I can relate to in my life very easily and hence it featured in my art. HC: Talking about your art-work, do the color choices specify anything? Choosing colors for your art-work plays a pivotal role. We artists choose colors based on different aspects that include which ones are more eye-catching. In this piece, along with this logic, I have used Orange and Blue colors to depict the FC Goa emblem. HC: Could you share with us what inspires you about FC Goa, any proud moment? Football has always fancied us Goans. But there are many among us, including me, who do not know about every football team that is there, or every match that is being played. But after the formation of the FC Goa team, it’s a pleasure to see all goans uniting as one in support of the state’s team. HC: Is there any specific message that you want to convey through your mural? I see that today’s younger generation are so consumed by the digital media. It seems like kids playing out on the grounds is a thing of the past. Also, children are pressurized to be so good at academics, that they don’t have the luxury of time to spend on their hobbies. So, I want to tell the children of today to please find the time and follow your heart. And I request parents to encourage their kids in their chosen sport and hobby. HC: How did you venture into Applied Arts and take it up as a career? Well, it had never been my plan. I was good at drawing during my early years of school but I soon gave it up. I would be more interested in outdoor activities and sports. After my higher-secondary education, on insistence by a friend, I just happened to join a tutorial batch that was being taken to guide students to get into the art college. I still didn’t have any plan to have a career in arts, but the encouragement that I received from the classes motivated me to go forward in arts, and from there, there was never looking back. Moving to Baroda was an up-ward learning curve. I got the opportunity to explore several different mediums of art practices. That’s when I learnt and started liking the concept of street-art. HC: What is it that you like about the street-art form? Street-art is a form of art-work that involves people. It aims at making art accessible to a wider audience. Street-art, like its name suggests, can be found within the cities we live in. It kind-of makes art available for everyone. HC: Who is your favorite street-artist? My favorite Indian street-artists would be Daku and Sameer Kulavoor. If you ask international artists, it would be Banksy and Shepard Fairey. HC: What do you think about the trend of street-art murals coming up in India? The St+art India foundation is one of the very few foundation, if not the only, that works on art projects in public spaces. I think people are still not completely aware and accustomed to street-art right now. Of-course it’s getting there, and people in Goa and a few other cities of Delhi and Mumbai have seen street-arts come up. But it’s still a fresh concept in India. 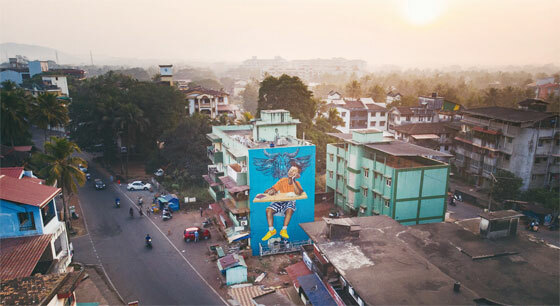 Delhi based artist of Goan origin, Dattaraj has painted one of Goa’s biggest football themed murals which depicts the state’s love for football through the eyes or rather aspirations of a young child. A multidisciplinary artist hailing from the state itself, Naik’s mural features a boy sitting at a study table dreaming about playing football. This mural represents a common situation amongst the school children in Goa who try to keep a balance between academic studies and their favourite sport, football. It brings forth the dreams and aspirations of a young child who wants to get out on to the field but is held back due to studies and other circumstances. The mural also sees a Gaur in the background which represents the club FC Goa, which represents Goa in the ISL. FC Goa and Forca Goa Foundation have supported the art project and are committed to the growth of not just football as a sport but also towards the culture of football.